The formation of AgNPs was confirmed by the development of dark brown color. 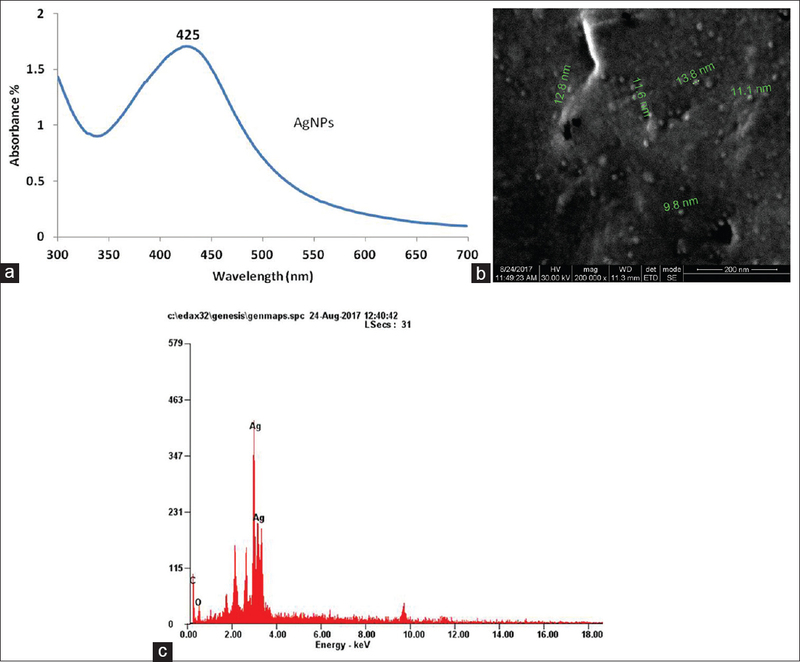 The ultraviolet (UV)-visible spectroscopy using Hitachi U-2900 UV-visible spectrophotometer recorded the reduction of pure AgNPs between 300 nm and 700 nm. The UV-visible spectra of the plant leaf extract and AgNO3 solution were also recorded. The UV-spectroscopy shows strong absorbance peak at 425 nm. [Figure 1]a shows the graph generated by UV-visible spectroscopy. MIC was calculated for AgNPs. [Table 1] shows the MIC. It was found to be 15 μg/mL for the synthesized AgNPs. [Figure 2]a, [Figure 2]b, [Figure 2]c shows the MIC of AgNPs for E. faecalis, K. pneumonia and C. albicans respectively. [Table 2] shows the Inter-group comparisons of all the four intra-canal medicaments against the test organisms. All the four medicaments had good antibacterial and antifungal activity. [Figure 3]a, [Figure 3]b, [Figure 3]c shows the antibacterial and antifungal activity for the three intra-canal medicaments. ANOVA analysis showed differences within the group. It was found to be statistically significant (P = 0.001). Varner K, El-Badawy A, Feldhake D, Venkatapathy R. State-Of-The-Science Review: Everything NanoSilver and More. U.S, Washington, DC: Environmental Protection Agency; 2010. Theivasanthi T, Marimuthu A. Studies of silver nanoparticles effects on micro-organisms. Ann Biol Res 2011;2:82-7. Satyavani K, Gurudeeban S, Ramanathan T, Balasubramanian T. Biomedical potential of silver nanoparticles synthesized from calli cells of Citrullus colocynthis (L.) Schrad. J Nanobiotechnology 2011;9:43. Balashanmugam P, Kalaichelvan PT. Biosynthesis characterization of silver nanoparticles using Cassia roxburghii DC. Aqueous extract, and coated on cotton cloth for effective antibacterial activity. Int J Nanomedicine 2015;10 Suppl 1:87-97. Prashanth S, Menaka I, Muthezhilan R, Navin kumar S. Synthesis of plant-mediated silver nanoparticles using medicinal plant extract and evaluation of its antimicrobial activities. Int J Eng Sci Technol 2011;3:6235-50. Haapasalo M, Udnaes T, Endal U. Persistent, recurrent and acquired infection of the root canal system post-treatment. Endod Top 2003;6:29-56. Tandan M, Hegde MN, Hegde P. Effect of four different intracanal medicaments on the apical seal of the root canal system: A dye extraction study. Indian J Dent Res 2014;25:607-12. Mozayeni MA, Haeri A, Dianat O, Jafari AR. 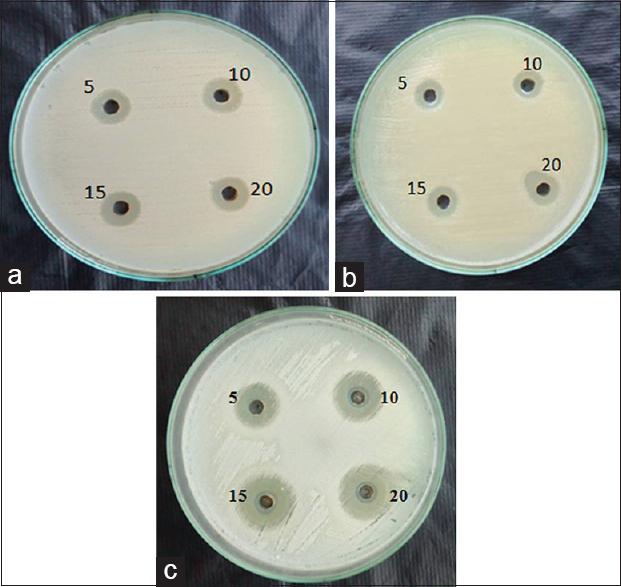 Antimicrobial effects of four intracanal medicaments on Enterococcus faecalis: An in vitro study. Iran Endod J 2014;9:195-8. Chandra BS, Gopikrishna V. Microbiology In: Grossman's Endodontic Practice. 13th ed. New Delhi: Wolters Kluwer Health; 2014. p. 45-7. Chua EG, Parolia A, Ahlawat P, Pau A, Amalraj FD. Antifungal effectiveness of various intracanal medicaments against Candida albicans: An ex vivo study. BMC Oral Health 2014;14:53. Hannula J, Saarela M, Alaluusua S, Slots J, Asikainen S. Phenotypic and genotypic characterization of oral yeasts from Finland and the United States. Oral Microbiol Immunol 1997;12:358-65. Topley WW, Wilson G. Parker MT, Collier LH, editors. Principles of Bacteriology, Virology and Immunity. 8th ed. London: Hodder Arnold; 1990. Tronstad L, Sunde PT. The evolving new understanding of endodontic infections. Endod Top 2003;6:57-77. Vidana R, Sullivan A, Billström H, Ahlquist M, Lund B. Enterococcus faecalis infection in root canals – Host-derived or exogenous source? Lett Appl Microbiol 2011;52:109-15. Murray PR, Baron E. American society of microbiologyetal. Manual of Clinical Microbiology. 8th ed. Washington: ASM Press; 2003. p. 422-33. Jett BD, Huycke MM, Gilmore MS. Virulence of enterococci. Clin Microbiol Rev 1994;7:462-78. Waltimo TM, Haapasalo M, Zehnder M, Meyer J. Clinical aspects related to endodontic yeast infections. Endod Top 2004;9:66-78. Waltimo TM, Orstavik D, Sirén EK, Haapasalo MP.In vitro susceptibility of Candida albicans to four disinfectants and their combinations. Int Endod J 1999;32:421-9. Ghandour W, Hubbard JA, Deistung J, Hughes MN, Poole RK. The uptake of silver ions by Escherichia coli K12: Toxic effects and interaction with copper ions. Appl Microbiol Biotechnol 1988;28:559-65. Schreurs WJ, Rosenberg H. Effect of silver ions on transport and retention of phosphate by Escherichia coli. J Bacteriol 1982;152:7-13. Roe D, Karandikar B, Bonn-Savage N, Gibbins B, Roullet JB. Antimicrobial surface functionalization of plastic catheters by silver nanoparticles. J Antimicrob Chemother 2008;61:869-76. Guzman M, Dille J, Godet S. Synthesis and antibacterial activity of silver nanoparticles against gram-positive and gram-negative bacteria. Nanomedicine 2012;8:37-45. Varoni E, Tarce M, Lodi G, Carrassi A. Chlorhexidine (CHX) in dentistry: State of the art. Minerva Stomatol 2012;61:399-419. Milstone AM, Passaretti CL, Perl TM. Chlorhexidine: Expanding the armamentarium for infection control and prevention. Clin Infect Dis 2008;46:274-81. Sreenivasan P, Gaffar A. Antiplaque biocides and bacterial resistance: A review. J Clin Periodontol 2002;29:965-74.
de Lucena JM, Decker EM, Walter C, Boeira LS, Löst C, Weiger R, et al. Antimicrobial effectiveness of intracanal medicaments on Enterococcus faecalis: Chlorhexidine versus octenidine. Int Endod J 2013;46:53-61. Seneviratne CJ, Leung KC, Wong CH, Lee SF, Li X, Leung PC, et al. Nanoparticle-encapsulated chlorhexidine against oral bacterial biofilms. PLoS One 2014;9:e103234. Mozayeni MA, Hadian A, Bakhshaei P, Dianat O. 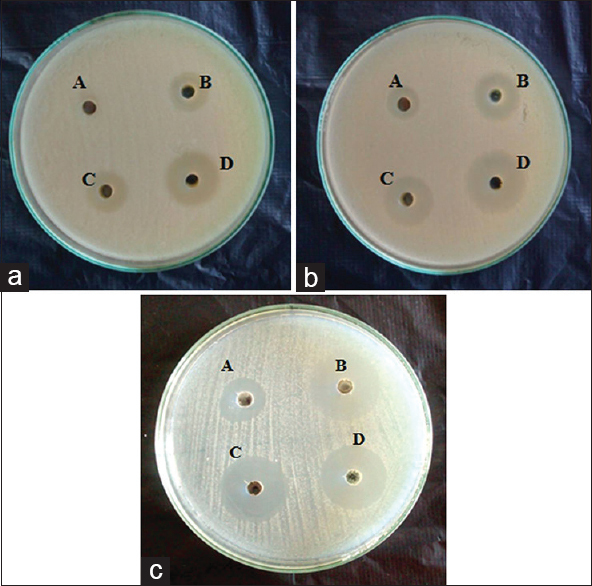 Comparison of antifungal activity of 2% chlorhexidine, calcium hydroxide, and nanosilver gels against Candida albicans. J Dent (Tehran) 2015;12:109-17.
de Souza-Filho FJ, Soares Ade J, Vianna ME, Zaia AA, Ferraz CC, Gomes BP, et al. 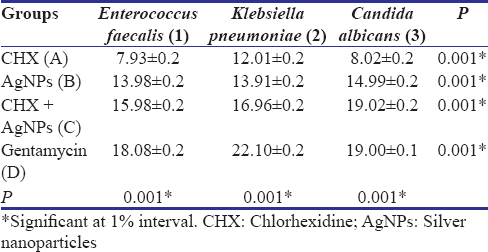 Antimicrobial effect and pH of chlorhexidine gel and calcium hydroxide alone and associated with other materials. Braz Dent J 2008;19:28-33. Carranza FA, Newman MG, Takei HH, Klokkevold PR. Carranza's Clinical Periodontology. 10th ed. Noida: Saunders, Reed, Elsevier India Private Limited; 2006.